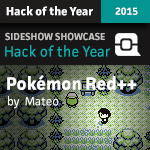 The goal for this hack is to serve as an updated version of Pokémon Red. It aims to eventually fix all of the most glaring oddities of Gen 1, and include many new features and gameplay elements that we have become accustomed to over the years. The story itself is still the same as Gen 1, though there are new locations and small changes to events here and there to freshen things up while still keeping it mostly true to the original Gen 1 story. Please check the Readme if you have a simple question. Almost all attacks updated to their Gen 6 effect, power, etc. Trainers have unique names, such as "LASS CONNIE" instead of simply "LASS"
In-Game Trade Pokémon have unique OT Names, not just "TRAINER"
Dual-Type Pokemon no longer incorrectly show "Super Effective" or "Not Very Effective" when hit by a move that is strong against one of their types and weak against the other. Fixed some issues with Bide damage calculation. Sleep moves don't ignore accuracy or overwrite other status conditions if the opponent needs to recharge. Fixed Psywave desync glitch from link battles (still more link battle fixes needed). Healing moves no longer fail on 255 or 511 HP. You are no longer permanently invulverable if you hurt yourself in confusion or are fully paralyzed during the turn when you should use Fly or Dig. Fixed a stat overflow bug in Reflect/Lightscreen. Rest now gets rid of bad poison. Defense cannot become 0 after stat scaling. Mirror Move + Partial trapping move desync glitch fixed (still more link battle fixes needed). Substitute no longer kills the user if they have exactly 25% HP. Fixed an obscure move selection glitch involving Disable and Strugge. Fixed sprites loading incorrectly if you looked at a Pokemon's stats while the opponent is Minimized or behind a Substitute. And before anyone asks, yes, you can buy Moon Stones and Sun Stones, so don't worry. Since people keep thinking this is a bug, I wanted to point out that all Pokémon who participate in battle receive the "full" amount instead of it being split between them. This is how it works in Gen 6, and was absolutely an intentional change. You can keep track of the project (or compile it yourself unofficially) by looking here. Last edited by Alice; 3rd March 2018 at 02:04 AM.